Cassettes of bronze wire mesh installed in the QNCC conference hall. German company Haver & Boecker is looking to promote the use of its superior architectural mesh products in the region, following the highly successful application of these products for the ceilings and walls at the Qatar National Convention Centre (QNCC) in Doha, Qatar. The QNNC, which opened its doors in December 2011, is claimed to be the largest exhibition centre in the Middle East with 40,000 sq m of exhibition space and facilities for up to 27,000 people. The modern and exclusive design of the exterior of the exhibition and convention centre – which sports Sidra tree-like steel structures on its façade – is continued in many rooms throughout the building. 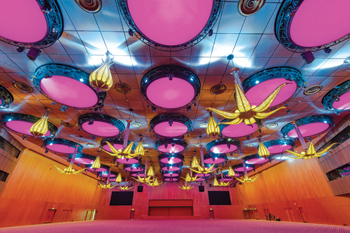 In addition to a 2,300-seat theatre, a multipurpose conference hall for 4,000 guests and several exhibition spaces, the interior of the QNCC offers an additional nine halls and 52 smaller rooms for conferences or banquets. The ceilings and walls inside the QNCC are clad with 6,000 sq m of architectural wire mesh made by Haver & Boecker, contributing to the modern design of the exhibition centre with functionality and sustainability, according to the manufacturer. “To meet the exclusive requirements of the centre’s ambience, the designers chose bronze and stainless steel wire mesh. The high-quality aesthetic of the architectural mesh, as well as the excellent long-life properties, non-flammability, easy maintenance and recyclability, made choosing Haver & Boecker wire mesh an easy decision for the client,” says a spokesman for the company. In addition to the theatre hall, the conference hall and the internal art wall, pre-finished cassettes of architectural wire mesh by Haver & Boecker were also made for the VVIP room and other meeting rooms. To get a precise fit, custom-made solutions were developed for the corner and ceiling areas. Elaborating on the installation, the spokesman says: “The single cassette elements consist of aluminium frames on which cable mesh, type Multi-Barrette 8123, and solid wire mesh, type Egla-Mono 4391, are glued. Due to their structure, the wire mesh types combine air permeability and acoustic neutrality with an optically closed and homogeneous overall picture. To improve the sound of the space, acoustic material was used inside the wire mesh cassettes. He indicates that the walls of the theatre hall are clad with bronze wire mesh, type Multi-Barrette 8123, which underlines the exclusivity of the ambience due its colour. “The elegance of the wire mesh allows interaction with various light reflections and gives the mesh a unique aesthetic. The wire mesh was specifically designed for the acoustic requirements of the theatre. It is coated with clear varnish, canted to the edges and glued into black-coated aluminium frames,” the spokesman explains. Cassettes of bronze wire mesh were also installed in the conference hall. To facilitate the multifunctional use of the room, many customised solutions were required for the ceiling and corner cladding, according to the spokesman. “Egla-Mono 4391 has a flat surface on one side which creates a very homogenous appearance. The architectural wire mesh was coated with clear varnish and glued to black-coated aluminium frames. Acoustic protection within the ceiling cassettes and wall cladding achieve noise-reducing effects and improve the acoustics,” he says. The large internal art wall consists of two sections, both of which are covered on one side with stainless steel mesh type Multi-Barrette 8123. The wall claddings consist of canted meshes which are glued onto stainless steel coloured aluminium frames. The wire mesh frames with integrated insulation were specially designed for the underlying air-conditioning. Located in Education City, QNCC is the first facility of its kind that is built to gold certification of the US Green Building Council’s Leadership in Energy and Environment Design (Leed). Renowned Japanese architect Arata Isozaki designed the QNCC with its tree-like structure. This structure gives the building an organic style that visually underlines the ecological concept of the whole project. The design of the building was inspired by the Sidra tree, a beloved and multifaceted icon in Qatari culture and the emblem of the Qatar Foundation. Haver & Boecker is a traditional family-operated, medium-sized company with its headquarters in Oelde, Westphalia, Germany. Its wire weaving division manufactures woven wire mesh and processes it into engineered woven wire products, which are used for architectural applications as well as for screening and filtration in the chemical, plastics and automotive industries, in the fields of aviation, aerospace and electronics, for industrial screening and particle size analysis and in the foodstuffs industry.